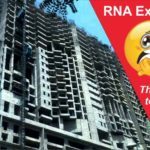 Mumbai, 5th March, 2016: Last week, one of RNA builders’ thousands of cheated flat-purchasers sent the builder a legal ultimatum, and started taking steps for going to court after discovering that their promised 17th floor flat in RNA Regal, a project in Kandivali West, is the proverbial pie-in-the-sky! In February 2011, Sandeep Kothari and Apeksha Khabiya, a non-resident couple based in Doha-Qatar, booked a spacious 17th floor flat in RNA Regal, based on the builder’s promise that they would get possession within three years. The couple planned to return to India to live in this spacious 1365 sq. ft. dream house. After paying nearly Rs 30 lakhs up front as initial booking amount, the couple was kept in the dark by RNA Corp which fed them a steady diet of outright lies during the three-year waiting period. Every time the couple phoned RNA Corp, they were informed that the project was making satisfactory progress. In the end, the couple’s rude awakening consisted of not one, but three shocking jolts! Shock # 1: When the promised possession date arrived in March 2014, Sandeep and Apeksha were shocked to learn that no further progress had been made in three years, and that the project was practically at a standstill at “25% progress”, the same as the time when they had booked the flat in Feb 2011. Today, two years after making this shocking discovery, they are still no closer to getting their dream house. Shock # 2: Almost five years after booking the flat and two yearsafter the promised possession date (March-April 2014), the couple was shocked to discover documents through Right To Information that showed that RNA Regal didn’t even have BMC permission for going up to 17 floors and above! Shock # 3: The couple recently sent their authorised representative to visit the site and make a first-hand observation about whether the construction work is in progress. They were traumatised to learn that no construction activities were going on, and the plot where RNA Regal was expected to come up, was partly blocked by slum dwellers. The authorized representative estimated that the encroachment by slumdwellers appeared to be two to four years old. 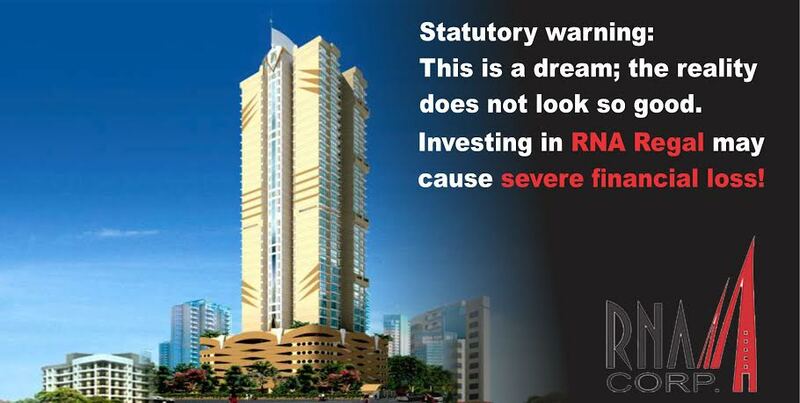 These are many causes for worry, not only for Mr and Mrs Kothari, but also for all the flat buyers in RNA Regal! RNA Corp’s owners, namely the late Anil Aggarwal, as well as his sons Anubhav and Gokul Aggarwal, have evidently been keeping a large number of buyers in the dark. The NRI couple booked a 1365 Sq. Ft. Flat on the 17th floor of RNA Regal, by paying Rs. 29.98 lakhs between February and June 2011 against the builder’s demand for Rs. 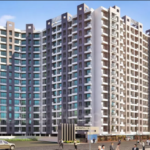 29.28 lakhs, being 25% of the flat’s total cost, along with expression of interest. Against this, the builder issued a letter of allotment. 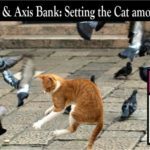 The NRI couple made this booking based on the builder’s representations that they would get possession of the flatwithin three years e. in the first quarter of 2014. Afterwards, the NRI couple regularly followed up the progress of construction of RNA Regal and were assured by the builder’s office that the project was satisfactory progressing. When the date of possession arrived in March-April 2014, RNA Corp informed the NRI couple that still, only 25% of the construction was complete, and the project was stuck due to some “additional statutory requirements”.The couple was assured that efforts were being made and the necessary clearances would be obtained soon. Upset at being kept in the dark until their promised possession date, the NRI couple now started enquiring about the project status by email on a regular basis. In an email dated 4th April 2014, the builder assured that that construction work would resume by June 2014. In an email dated 14th June 2014, the builder claimed that the approvals are expected within 10-15 days. In an email dated 2ndJanuary 2015, the builder said that the necessary approvals would take another 2-3 months. Later on, the NRI couple’s emails dated 31/07/2015, 04/08/2015, 06/08/2015, 07/08/2015 20/08/2015 and 23/08/2015 and letters dated 08/12/2015 and 05/02/2016 were acknowledged by the builder’s office only with great reluctance, but they all went unanswered. Whenever the NRI couple or their authorized representatives visited India, they made it a point to visit the builder’s office to inquire about the progress on this project and understand the earliest date of their getting possession, so that they could permanently return to India and live in this house. But during their every visit, the NRI couple were told about some or the other kind progress as well as difficulties that the RNA Corp had been facing. RNA Corp continually made promises, but there was no performance to back up these promises. In spite of repeated requests, RNA Corp did not fulfill their obligation for executing a registered Agreement for Sale. The NRI couple got a huge shock when they learned through RTI thatRNA Corp had not even obtained approval for constructing a building with 17 or more floors! The Kotharis requested their authorised representative to visit the site and make first hand observation about the actual progress and whether the construction work is in progress. They were traumatised to learn thatno construction activities were going on and the plot where RNA Regal was projected to be constructed was partly blocked by slum dwellers. This encroachment appeared to be 2 to 4 years old! Driven by all these unpleasant discoveries, Sandeep Kothari and his wife Apeksha have now reached the inescapable conclusion that RNA Corp has cheated them by retaining their money for more than five years, and has kept on making false statements as well as promises, which entitles them to invoke all legal remedies against the builders, especially under Consumer Protection Act, 1986. Postscript: Of late, RNA Corp has been in the news for failure to fulfill legal obligations to various stakeholders, including flat-buyers, project-affected-persons, lending banks, and multiple government agencies such as MCGM and MMRDA. After years or even decades of slippery behaviour by the late Anil Aggarwal and his sons Anubhav and Gokul, the patience of many stakeholders appears to have run out completely. A group of 24 people’s dreams of owning a house in this city known for its steep real estate prices, was rudely cut short when they realised that the builder had been duping them with plans of building a 33-storey building when he permission to build only 14. 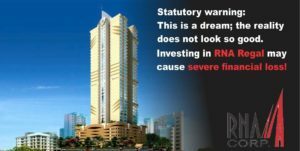 After over five years of false promises, Kiran Talekar, one of the buyers, joined forces with 23 others to finally file an FIR against RNA Developers for cheating them of Rs 15.5 crore. The FIR names East and West Builders, an RNA subsidiary, and its directors Anubhav Agrawal and Gokul Agrawal.